Over the years, the level of awareness among the global population regarding the various types of cancer has increased tremendously. The significance of early detection and diagnosis is not lost on them, resulting in the increased adoption of screening tests such as cytology and human papillomavirus (HPV) testing. The global market for cytology and HPV testing is presented with a host of sustained growth opportunities arising mainly from several emerging economies, where factors such as rapidly developing healthcare infrastructure and a strong local manufacturing base serve as major advantages. In addition to this, these markets still have immense scope for growth, unlike the near-saturated markets in developed countries. The cytology and HPV testing market can be geographically segmented into Europe, North America, Asia Pacific, and Rest of the World. North America is by far the largest market for cytology and HPV testing accounting for a 52.5% share in 2015. This can be attributed to the rising incidence of HPV infections and cervical cancer, the increasing number of awareness programs by government and private organizations, and the availability of technologically advanced diagnostic test kits. The Centers for Disease Control and Prevention states that an estimated 79 million people in the U.S. are infected with HPV, with around 14 million people newly infected each year. Each year, more than 11,000 women in the country are diagnosed with cervical cancer. The rising adoption of cytology and HPV testing is driven by the same factors as those fueling the North America market. In addition to these, the soaring demand for advanced imaging modalities and sensitive screening tests such as liquid-based cytology are anticipated to further accelerate the Europe market. Germany is the largest contributor to the Europe cytology and HPV testing market owing to the recent introduction and enhancement of various new technologies in the field of diagnostics. Government screening programs have also favorably benefited this regional market. Emerging as one of the most attractive destinations for cytology and HPV testing as well as for the manufacturing of testing kits and systems, Asia Pacific is anticipated to witness immense growth during the forecast period. Thanks to the availability of low-cost and highly-skilled IT labor, leading companies such as Qiagen N.V. and Hologic Corporation have been setting up shop in APAC to capitalize on the opportunities presented by this region. Although the RoW segment is also anticipated to witness a rise in the demand for cytology and HPV testing, especially in Africa, the narrow distribution network as well as the low awareness and adoption rate in several underdeveloped regions are likely to hamper market growth. HPV testing services dominate the HPV testing market, accounting for a whopping 78.2% share in 2015 owing to an increasing number of women undergoing HPV tests for the detection and diagnosis of cervical cancer. Similarly, cytology testing services led the cytology testing market with a 78.7% share in 2015. This is due to the large number of PAP tests performed across the globe. The soaring incidence of HPV infections and cervical cancer can be attributed to several risk factors, including the weakening of the immune system due to illness and a high number of sexual partners. Technological advancements in healthcare and growing awareness among the general population are also encouraging people to opt for high-accuracy diagnostic tests. Driven by these factors, the HPV testing market is expected to grow from US$7.9 bn in 2015 to US$10.5 bn by 2024 at a 2.9% CAGR therein. This report on the global cytology and HPV testing market analyzes the current and future prospects of the market. The report comprises an elaborate executive summary, including a market snapshot that provides overall information of various segments and sub-segments. The research is a robust combination of primary and secondary research. Primary research formed the bulk of our research efforts with information collected from telephonic interviews and interactions via e-mails. Secondary research involved study of company websites, annual reports, press releases, stock analysis presentations, and various international and national databases. The report provides market size in terms of US$ Mn for each segment for the period from 2014 to 2024, considering the macro and micro environmental factors. Growth rates for each segment within the global cytology and HPV testing market have been determined after a thorough analysis of past trends, demographics, future trends, technological developments, and regulatory requirements. Cytology and HPV testing kits are used extensively in PAP testing and cervical cancer testing. This report on the cytology and HPV testing market analyzes the current and future prospects of the market. An elaborate executive summary includes the market snapshot demonstrating overall information on various segments and sub-segments. This section also provides the complete information and data analysis of the cytology and HPV testing market with respect to the leading market segments based on product and services, and geography. The market overview section of the report includes qualitative analysis of the overall cytology and HPV testing market including the determining factors and the market dynamics such as drivers, restraints, and opportunities, along with Porter’s Five Forces Analysis. This section of the report also provides market attractiveness analysis with thorough analysis of the overall competitive scenario in the global overall cytology and HPV testing market. In addition, epidemiology of HPV and cervical cancer has been provided which gives incidence rate, annual number of new cases, and mortality of HPV-related cervical cancer in different countries. The competitive scenario between different market players is evaluated through market share analysis. These factors are anticipated to help the market players to take strategic decisions in order to strengthen their positions and increase their shares in the global market. The cytology and HPV testing market has been segmented based on product and services, and geography. Furthermore, each type of testing has been categorized into assay kits, systems, and services. Market revenue in terms of US$ Mn for the period between 2014 and 2024 along with the compound annual growth rate (CAGR %) from 2016 to 2024 is provided for all the segments, considering 2015 as the base year. Geographically, the cytology and HPV testing market has been categorized into four regions: North America, Europe, Asia Pacific, and Rest of the World (RoW). All the mentioned geographies are analyzed by major countries for cytology and HPV testing. The recommendations section included in the report is likely to assist existing players to increase their market shares and new companies to establish their presence in the cytology and HPV testing market. The report also profiles major players in the market based on various attributes such as company overview, financial overview, business strategies, product portfolio, and recent developments. 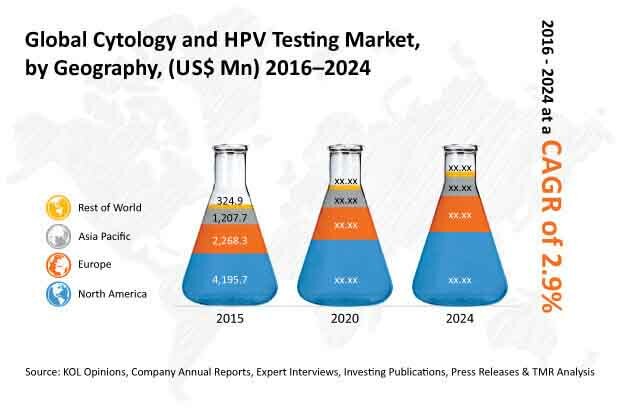 Key players in the global cytology and HPV Testing market are Becton, Dickinson and Company, Cepheid, Inc., Abbott Laboratories, Inc., F. Hoffmann-La Roche AG, Fujirebio Diagnostics, Inc., Arbor Vita Corporation, Hologic, Inc., QIAGEN N.V., and OncoHealth Corporation.